The Hindu Society of Nevada e-newsletter is sent every month detailing the activities scheduled at the Temple. For the latest information, Please always check the Temple website www.hindutemplelv.org. Happy New Year and Thank you for supporting the Hindu Temple of Las Vegas this past year. We look forward to your continued support and participation in Temple Activities in 2011. 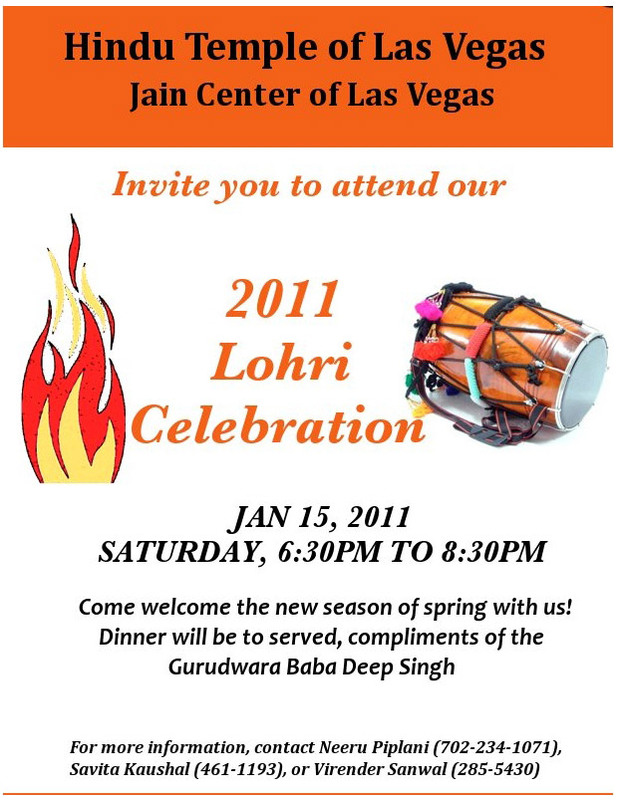 Come celebrate the season of Spring at the Temple during Lohri festivities. Lohri is a festival to worship Fire. Prayers are offered around the Bonfire seeking abundance and prosperity. People make merry by dancing and singing traditional folk songs. Our Thanks to the Gurudwara for preparing and sponsoring the food for this event. During the Abhishekam, Vishnu Sahasranama Stotram is recited. Please bring fruits, flowers and a gallon of milk if sponsoring the Abhishekam for $101. Please bring fruits, flowers and a gallon of milk if sponsoring the Abhishekam for $101. Sri Satyanarayana Pooja is performed at the Temple on Poornima (full moon day). Please bring flowers and fruits if sponsoring the pooja for $101. We have made some important changes to the Food Sponsorship Program at the Temple. Due to the involvement of Volunteer Groups who have stepped forward to cook food at the Temple on Sundays, we will no longer charge a donation for food served at the Temple on Sundays. We will continue to charge a donation for major events at the Temple due to the costs involved. Please contact Neeru Piplani 234-1071 OR Savita Kaushal 461-1193 if interested in volunteering for food preparation. The charge to sponsor the food program on Sundays is $250. This donation will go 100% to the Temple. Please contact Dilip Shukla 808-2505 OR Ramesh Piplani 445-4223 if you would like to sponsor. We are also looking for Sponsors for the following items used for the food program: Water Bottles (Vikas Khurana), Rice, Daal, Sugar, Ghee, Vegetables, Roti. If interested, Please contact the Food Commitee Members listed above. Year end letters detailing your charitable contributions to the Temple for the calendar year 2010 will be sent in the first week in February. The January Mailer will be sent to all devotees in the first week of February. A complete breakdown of the Income and Expenses for 2010 and the Calendar of events for 2011 will be included iin the Mailer.